It is time to love your gut with the Avisae Pre+Probiotics Pixie! 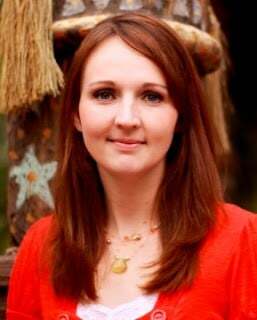 What are Avisae Love Your Gut Pre+Probiotics Pixie? Love your Gut! Avisae OptimALL Nutrition™ pre+probiotics™ pixie is a proprietary synbiotic blend that’s scientifically formulated to balance your gut-bacteria. Pixies are easy to take and taste great! 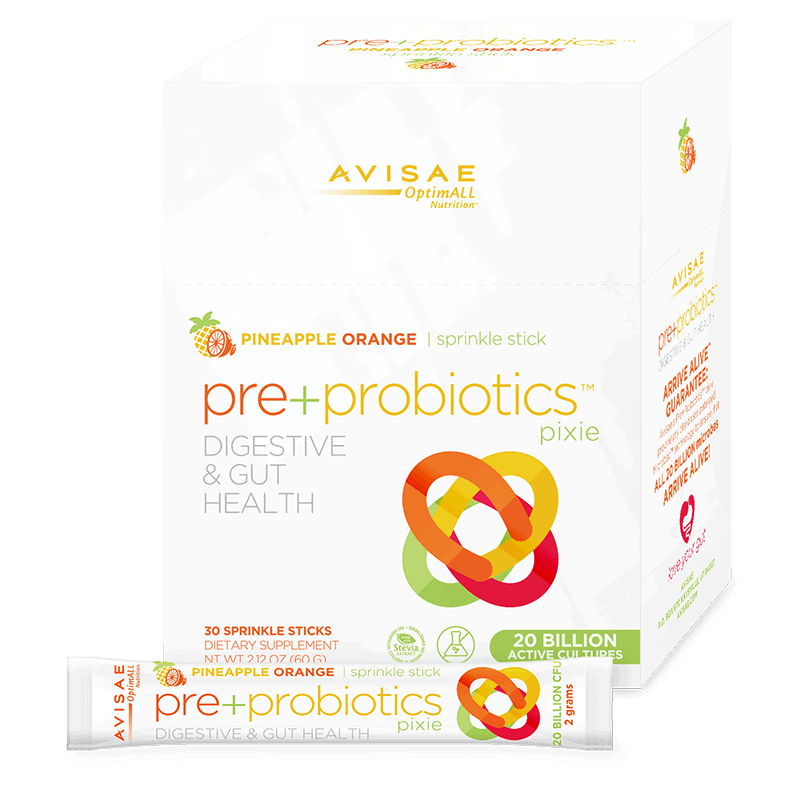 AvisaeTake one (1) pre+probiotics™ pixie daily to support digestive and immune health. To alleviate occasional digestive distress, take two (2) pre+probiotics™ pixies per day. If taking 2 pixies, take one in the morning and one in the evening or following two separate meals. These pixies are a powder that you can take right from the package. No water needed and perfect for an on-the go lifestyle. 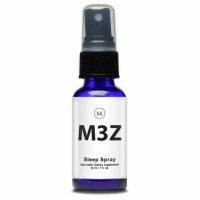 Who should take Avisae Pre+Probiotics Pixie? An Adult under 100 lbs or a child should take 1/2 a Pixie. Adults that are over 100 pounds can take 1-2 Pixie’s per day. An adult on antibiotics should take 3-4 Pixie’s a day for 3-4 days after a short bout of antibiotics or 4-5 pixie’s a day for 4-5 days on antibiotics. Note: If you’re on antibiotics long term then take 1 at minimum but 2 is ideal. If you take your antibiotic at 8 am then take the pixie’s at 8 pm to give them a fighting chance to colonize. 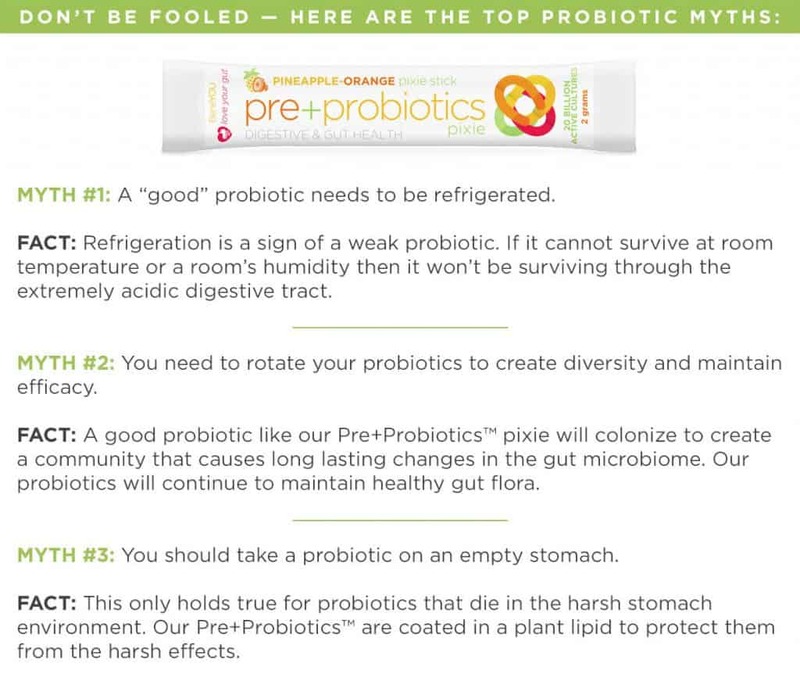 There are so many myths surrounding a probiotic. Here are some of the common questions for someone wanting to take a probiotic. 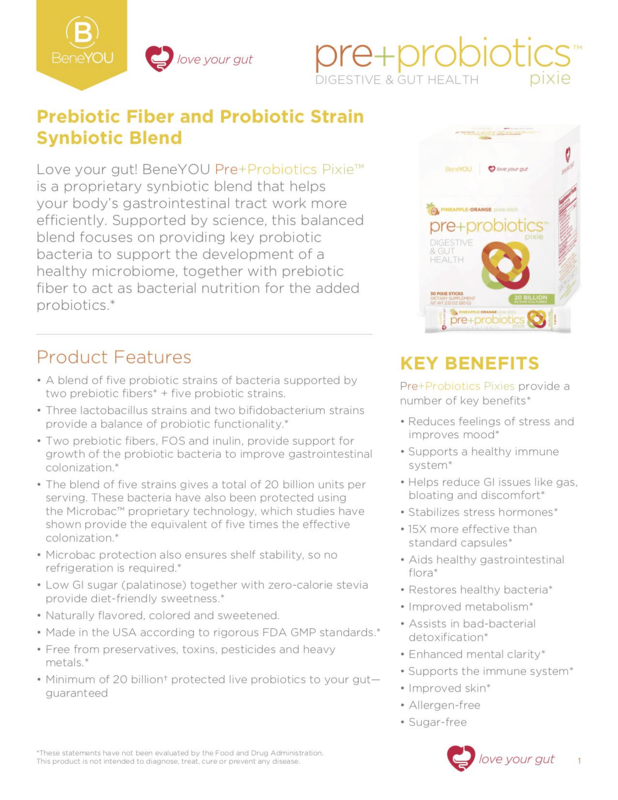 Click on these fact sheets to learn information and Key Benefits of the BeneYou pre+Probiotics Pixie and see how it can help you to Love Your GUT! Get your Avisae Pre+Probiotics Pixie NOW! 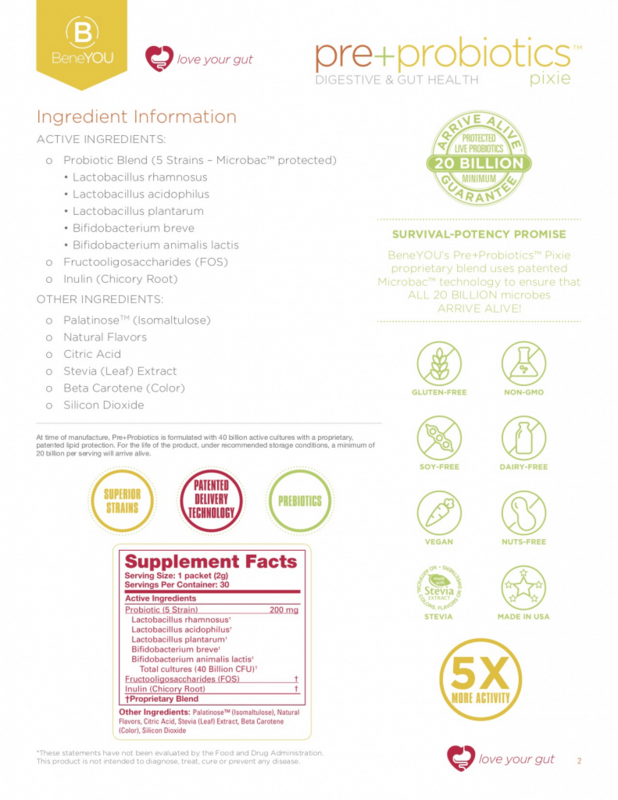 You can get your Pre+Probiotics Pixie online at BeneYou.com. Each box comes with 30 Pixies for a one month supply. 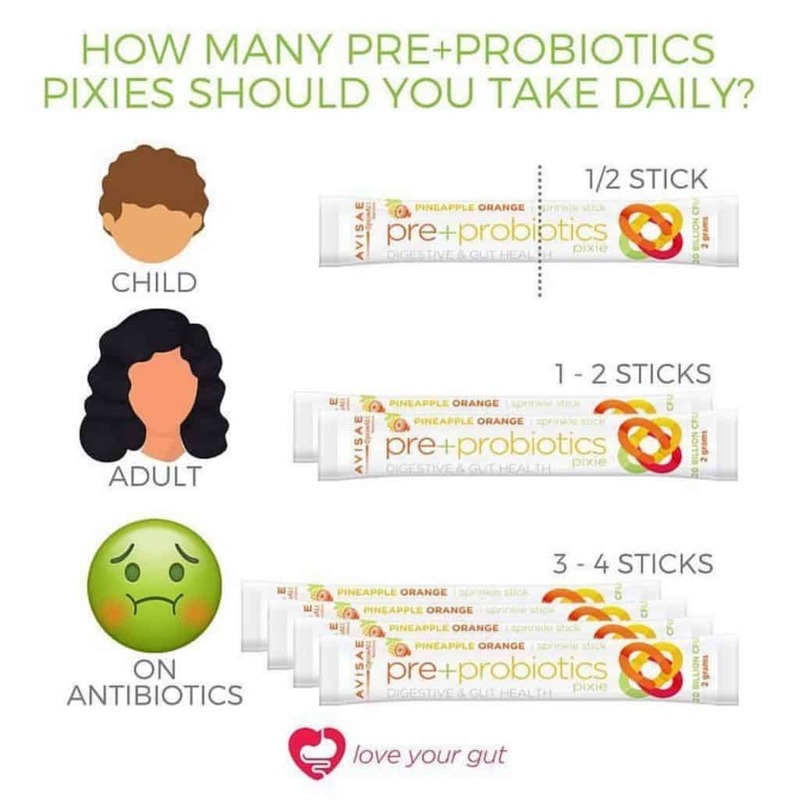 If you are going to be taking 2 a day, your you have family members who will also be taking the Pre+Probiotic Pixie, make sure and order accordingly. Here are some of your favorites.